Over the past few weeks, I’ve been preparing the materials for an emergency communications course. It’s amazing that when someone else has prepared over 600 PowerPoint slides (with notes) that it would take so much time to update. Why? Because what we know today about dealing with disasters is more than what we knew before Hurricanes Harvey, Irma, and Maria. Personally, I believe that being better prepared for the future is a good thing. On the other hand, I’m working on my short story—which has become at least a novelette (a short version of a short book? Huh? )—continues to develop. The more I learn about the characters (and more characters keep popping up), the more complex—but interesting—the story becomes. However, if a new character appears, a whole lot of the backstory changes. As a writer, I have a certain duty to the characters. Without me, they are doomed to shrivel away to nothingness, through no fault of their own. They deserve better, so I try to tell their stories. So far, the characters include a not-quite-dead aged business multi-multi-billionaire, several lawyers, most of whom are self-serving, but one of whom has a national security background, a distant relative who can see how the pieces fit, and someone (thing?) who seems to have many of the answers, but who is known as Zaznoz (sounds like a new drug or a new exercise routine to me). Then I do need to devote time to the day job. Not to mention that we celebrated Christmas with close friends, followed by my daughter-in-law and the grandchildren, who drove ten hours (I think she was being nice and understated the journey length) to visit us and to make for a wonderful time. 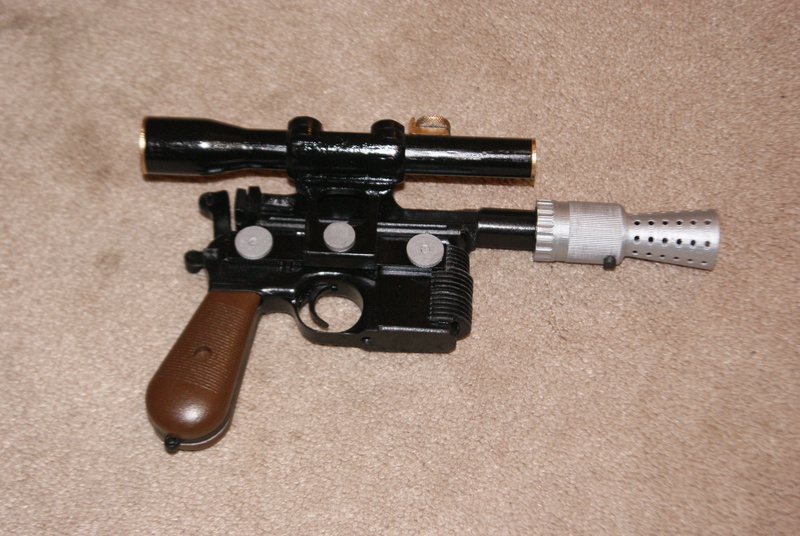 Han Solo’s Blaster (Let’s me shoot first). So, as you see, it’s not lack of interest in blogging, just lack of time.